Cambridge Paper London launch- 18.30. 24 Jan Bristol Talk by Rowan Williams on Faith and Climate Change at the Elim Church on 24th January:Climate Change: A matter of faith – As part of Bristol Green Capital 2015 Global Aware Conference this year will focus on the pressing issue of climate change and how we as people of faith can respond through action in our churches and local communities and as individuals. Keynote Speaker Dr Rowan Williams, Chair of Christian Aid – Including voices and reflections from the Global South on the impacts of climate change and ideas and examples from Bristol on how we can respond as churches and individuals. Thursday January 29th HOME – a film about the planet and how mankind is altering its balance. Wednesday February 11th CHOCOLATE – a film about a chocolate co-operative operating in Grenada. Thursday February 26th WATERMARK – a film about the necessity of water. Wednesday March 11th THIN ICE – a film answering the sceptics of man-made climate warming. Speakers: Bishop of Sheffield, Steven Croft, on how faith aids us in tackling climate change. Paul Blomfield MP; Effective ways of lobbying our MPs. Revd Herbert Fadruiqela, on the Philippines and international issues. Places are limited- please register your interest by emailing hopeftf@gmail.com. 2 Feb is World Wetlands Day Click for Resources. Photo competition for 15-24 yr olds. Wetlands provide a multitude of benefits to humanity that include filtering our water, ensuring biodiversity, protecting our coastlines, and mitigating climate change. Yet scientific estimates show that 64 % of the world's wetlands have disappeared since 1900 and the remaining ones are being degraded. 10 Feb Hereford 7.30 pm Hereford Christian Ecology Group present an illustrated talk on Wild Bees by Hayley Herridge, from Herefordshire Nature Trust, in St John's Methodist Church Hall, St Owen Street, Hereford HR1 2PR. All welcome. Take part in a prayer vigil outside Church of England General Synod On Wednesday 11 February Christian Climate Action will host a prayer vigil outside the Church of England General Synod. The vigil will include prayer, reflection and stories from people affected by climate change. The vigil will take place at 8.30am outside the Synod. Look out for further details on Christian Climate Action’s Facebook page. 18-25 Feb Bentham N Yorks Churches Together in Bentham Lent Lunch Talks:"The Churches' Response to Climate Change (with reference to the food chain and waste) - Caring for God's Creation - Wednesdays 12.30, at Bentham - Methodist Chapel. Jacob's Join on 18 Feb and 25 March. other Wednesdays, bread and cheese are provided by the churches and Quakers in turn. Details from Revd Timothy Fox: Download Poster editimfox@btinternet.com 015242 62575. A Kindly Use of Lane Led by Lydia Reese from the Hilfield Friary Community - There is a movement afoot which emphasises the importance both of wise husbandry of the land and of our interdependence with it, for food, for sustainable living and for joy. In this weekend we will be looking at some of the writers on this subject – Wendell Berry, Norman Wirzba, Aldo Leopold – and drawing on their wisdom to learn how this can be lived today in our own situations, whether we live in town or country. We will be joined on the Saturday by Rob Walrond, a dedicated farmer and Rural Life Advisor for the Diocese of Bath and Wells. Lydia Reese has taught conservation in her home country of America, and for the past 18 months has been working on our land at Hilfield. Like Rob, she is passionate about the wise and sustainable use of land. Come with boots and outdoor clothing! Pray and Fast for the Climate- LONDON BOROUGHS FAITHS NETWORK with COLLABORATION HOUSE COLLEAGUES INVITE YOU TO Pray and Fast for the Climate- at Collaboration House, 77 Charlotte Street, W1T 4PW- contact convener@lbfn.org 07903 682 142. Londoners from religious and philosophical traditions are joining together in solidarity with others worldwide. We are meeting at different venues in London on the first day of each month until UN COP 21 in Paris, December 2015. The evening meeting will include short prayers and reflections using www.ourvoices.net resources, a simple meal to break the day’s fast, and discussion of related actions. Not everyone will be fasting but all are welcome. 7 March Baildon Methodist Church Run on Sun Fun at Baildon Methodist Church, Newton Way, Baildon, West Yorkshire. BD17 5NH. 2-5pm There will be many sunny activities for primary school children to make and do, together with sun buns a-plenty to eat. Activities to keep the adults occupied include test driving an electric car (part charged by the sun), and viewing and buying solar lights or solar PV panels to generate electricity. There will be much sunny singing. The aim is to encourage schools to put PV panels on their roofs. John Anderson, the organiser, will be in a fluffy sun-suit. Environment Conference 9.00am-4.30pm A day conference asking how Christians should respond to the challenges of climate change. Organised by Redcliffe College in parthership with The John Ray Intiative and A Rocha UK at Redcliffe College near Gloucester. This is likely to book up so book early. Operation Noah, together with other Christian organisations, will be hosting a church service at St Mary le Strand from 11.30am to 12.30pm before the march begins, with hot drinks and toilets from 10.30am. This will also be a place to meet other Operation Noah and Christian supporters to join the faith block of the march. Please let Operation Noah know if you intend to come along or would like to help with the church service. Speakers include: Bishop Richard Cheetham (Bishop of Kingston) who will explore the spiritual inspiration for this work and reflect on the science and political issues from a Christian perspective. Eilidh Macpherson (Campaign Manager at CAFOD) who will provide the context and political overview of the climate movement for this year and beyond. Hope for the Future and Operation Noah will lead workshops on how to inspire your church community to engage in the climate movement and how to effectively lobby your MPs. 21 March Hilfield Friary, Dorset ‘The Ethics and Politics of Climate Change’. A day to explore and discuss the things we should be asking candidates before the forthcoming general election. Overview - are local environmental organisations merely groups of white, middle class and middle aged NIMBYs, with an eye to property prices? Have the UK’s major environmental pressure groups such as Greenpeace and Friends of the Earth lost their way? Has the environment dropped out of the media and public consciousness? Drawing on examples where local, national and international environmental imperatives have clashed, the lecture will range across some initiatives apparently intended to improve the environment, including The Mayor of London's Low Carbon Prize, the Transition Town Network and the National Industrial Symbiosis Programme. The ‘voices', of some of those centrally involved the debates will be heard, whilst we explore whether any of these organisations actually made a difference. You do not need to register for this free public event. It will be run on a "first come, first served" basis, so please feel free to arrive a little early to ensure that you can get a seat. Help manage Scargill’s wonderful gardens and estate, and have plenty of time to relax too. We’ll be working hard outside in the mornings, and joining other guests for the afternoon and evening. You need to be 18 or over to join us, and the cost is half that of a normal event. A retreat discerning the peculiar perspectives people of faith have on how we live in and leave for others God's earth. This is the 32nd course over the last 12 years. More than 750 people have taken part and all the major UK agencies (from ActionAid to Save the Children, from OXFAM to AFRIKIDS ) have sent staff for training. Papal Ecology- at Pantasaph Friary, North Wales: An Ecumenical weekend to explore the writings of John Paul II, Benedict and Francis on the greening of the church and society. Pope Francis’ first encyclical is soon to be released on the subject of ecology. Christians of all denominations are preparing for a storm of new interest in a greener Christian lifestyle. This weekend, you will learn the essential background to our relationship with creation and how you can live it. With a friendly, ecumenical team, sharing & relaxing times of prayer. Speakers: Martin Palmer ( Alliance of Religions and Conservation ..and the Green Global Pilgrimage Project -in which St Albans Cathedral is one of the founder members). 25 April Ripon College Cuddesdon nr. Oxford Contemplative Activists: - living in God’s heart for justice today. This is a CRES (Christian Rural and Environmental Studies) Day conference at Ripon College Cuddesdon nr. Oxford, from 10.00am-4.00pm. The speakers are Greg and Ruth Valerio. Greg will begin the day by looking at spirituality, and particularly Monastic and Celtic spirituality. Ruth will then explore an area that is one of her key interests - food and faith. Finally Greg will return after lunch to tell us about his work in Fairtrade gold and jewellery. climate change is affecting communities least able to cope. Overview - There are many environmental initiatives and legislation affecting the British countryside: protection of scenic and habitat areas, safeguards for particular species, restrictions on development, and animal welfare legislation. However, our countryside is still damaged by pressures that are reducing biodiversity, increasing flooding, damaging soil fertility and rendering our scenery less diverse. The reasons behind environmental deterioration will be examined as well as strategies to improve quality whilst feeding more people. No reservation required - You do not need to register for this free public event. It will be run on a "first come, first served" basis, so please feel free to arrive a little early to ensure that you can get a seat. Tour and talk at IKEA, Milton Keynes at 7.00pm - Paul Allen, Sustainability specialist at IKEA will explain what IKEA has done to reduce the impact of the business on the environment and also provide some ideas that could be applied to churches and church halls. We will also hear from Paula Cade, who will tell us about her experiences on an ambassador trip with UNICEF via IKEA foundation, a charity set up by IKEA. Meet at 6.30pm in the café for a meal beforehand (use the normal customer entrance). Wear flat shoes (no high heels) as the tour includes areas with machinery and a low risk of tripping up. Could your church hold an outdoor event? See pictures of previous events? 10 May Clapham, Yorks Dales Rogation Sunday and Pet Services at 1100 at Clapham. St Peter's, Church St, Addingham LS29 0QS: following the Family Communion Service (10am) - there will be a blessing of the Church Orchard opposite the Church at 11.30am. There may be a special event in the afternoon. 15-17 May Hilfield Friary, Dorset ‘Hope for Creation’, the role of communities in sustaining nature, led by Sir Ghillean Prance and Andy Lester. 19 May Hereford Hereford Christian Ecology Group will hold its AGM at St John's Methodist Church, St Owen Street, Hereford HR1 2PR, at 7.30 pm. All welcome. Sat 23 May Peterborough Sir Ghillean Prance: The Biological Evidence for Climate Change. Peterborough Cathedral, 7.30 A contribution to Peterborough's Green Festival by the Eco-faith Network. 24 May Wenningside Farm, Keasden, N Yorks Lambing Service - at Wenningside Farm,Nr.Keasden at 7.00pm. Join the struggle for a clean, safe and sustainable future. If we want to win, we have to stand together, build power and take action. Members of Christian Climate Action will be there for some of the weekend. St Martin-in-the-Fields, Trafalgar Square, London, WC2N 4JJ Phone: 020 7766 1100 7.00-9.00pm. Join in solidarity with people across the planet as we fast and pray for the climate, leading up to the UN Climate Conference in Paris, December 2015. An evening of silence, prayer and collective action Planting Seeds for Hope. To break fast after the vigil stmartinssns@gmail.com. WESTMINSTER JUSTICE AND PEACE: PRAY FOR THE CLIMATE 1 June @ 6:00 pm - 7:00 pm 23 Kensington Square, London, W8 5HN monthly prayer and fasting vigil with Westminster Justice and Peace. Please bring picnic chair, mug, plate & cutlery and please share transport where possible. 7 June UK The Big Lunch -organise a communal lunch - and why not make it a green one? looks after a small public garden in a nearby road. 7 June UK Open Farm Sunday Visit a farm near you. Would you like your churchyard to become and opportunity rather than a burden? Then come to this special one day event, designed for those managing burial grounds. 13/14th June Churchyard Weekend St Chad's, Headingly, Leeds. be open – fantastic views but steep access steps. of St Chad’s Green Team. of the Church Building and some Churchyard Memorials”. The Wake up your church! workshop enables Christians to make powerful connections between faith, everyday life and challenges of justice and environmental sustainability. The event offers: an invitation to hear God's call afresh; a new look at our local and global situation; personal challenge, transformation and growth; renewed energy & growth in a church congregation. The workshop draws on a rich mix of practical and theo-logical material presented in a lively and varied way. There is engagement with the bible, reflection and group activities. There are short film segments on environment and social justice issues with video input from leading Christian speakers including Tom Wright, Elaine Storkey and John Bell. Facilitators: Mike Arundale and Rev’d Ali Oxborrow. Mike worships at St James & Emmanuel church, Didsbury. He is a Lecturer in Strategy at Manchester Business School and Chair of the Boaz Trust, a Christian charity serving destitute asylum-seekers. Ali is an ordained Anglian minister who previously worked as a solicitor in matrimonial law. She holds a Masters in Theology and is a trained counsellor. She served her curacy in Didsbury and has recently trained as a Restorative Justice Volunteer Facilitator with Greater Manchester Police. Tea & coffee provided, but please bring your own lunch. Day of climate action. Come and tell your newly elected MP and the Government that the time for climate action is NOW. It will be a day filled with music, debate, friendship, solidarity and hope. There will be an ecumenical service and interfaith worship opportunities. Bunting-making is a great way to get your church family, home groups or local schools involved in the event now. People who would like to support the lobby, but can’t get to London that day, can speak up with bunting that you can take along with you! The service will be at 12 noon. Meet up with other GC and Operation Noah supporters outside the Emmanuel Centre at 11-45. See here for more information and also please sign up at the bottom of here to let us know you are coming. The day will kick off with an ecumenical church service. This is an opportunity for those who'd like to, to start the day with worship and prayer ahead of going on to lobby our MPs. Our main speaker will be the Bishop of Salisbury, the Rt Reverend Nick Holtam, with contributions from Ruth Valerio, Andy Flannagan, and staff and partners from Christian Aid, CAFOD and Tearfund. The ecumenical service will take place simultaneously in two churches (St Margaret's, Parliament Square and Emmanuel Centre, Marsham Street) with our main speakers speaking at both. 19-21 June Hilfield Friary, Dorset ‘Brother Soil and Sister Slug’, Franciscan family wisdom for an Ecological Garden. Led by Richard Thornbury of the Hilfield Friary Community. 20 June Ingleton Beginners Workshop on Lichen Identification in Ingleton Churchyard. 9.45am-12 midday. Learn secrets about these fascinating organisms, and how to identify common big species. 3/4 hour indoor illustrated introduction to lichen structure followed by 1 ½ hour walk in churchyard to look at lichens. Hand lenses provided. Part of the Ingleton Overground Undergound Festival www.ogug.co.uk. £15. Booking necessary. 21 June Settle /Keasden Settle Messy Church afternoon picnic visit to Keasden Head Farm - to see farm, animals, countryside and wildlife. from the pioneers of the organic moment. a ‘mini-beast walk’ with David Beattie (A Rocha UK). Plus, (Another A Rocha UK Partner in Action) and Rock UK. Hall for a wider Church community event including a lecture. The weekend will end with Church services at 9.30am in St.
27 June Hilfield Friary, Dorset ‘Seeking Sustainability’, a day conference on why it’s important and what we can learn from each other. As a part of their Bee Campaign, Capel y Nant church (www.capelynant.com) in Heol y Nant, Clydach, Swansea SA6 5HB will be teaming up with Friends of the Earth Swansea to show the film ‘More Than Honey’ on Tuesday, June 30, at 7 pm. The free, public evening will be held at Neuadd y Nant venue, alongside Capel y Nant. Described a as ‘stunningly beautiful’ film, ‘More Than Honey’ looks at the relationship between bees and people in six locations in various parts of the world. It provides the background for the current crisis facing the honey bee population. For more information, email Hywel Davies at: teulu217@btinternet.com or phone 01792 798162. “The Arundel Pilgrimage 2015” from Chertsey to Arundel visiting much of the diocese on the way from August 15th to August 30th 2015. This study day (open to all) will explore some of the latest thinking about how the Christian gospel relates to climate change. There will be opportunities to hear about (and visit) do-able projects that may inspire your own action and prayers, as well as share ideas and practice with others. The day will be led by Rev. Dr. Richard Goldring, Synod Development Officer, and Rev. Alex Mabbs, minister of Brighthelm. 12.15-17.30 Cherishing Churchyards and Burial Grounds. NW8 7NE "Beauty in Tranquility" - Booking Necessary. Keynote speaker: Duncan Wilson, Chief Executive of the newly established Historic England. Evening address by Prof David Goode. Admission to high tea and wine by ticket only.
. The afternoon event will be followed by high tea and a wine reception, then an evening address from Professor David Goode, the renowned ecologist, visiting Professor at UCL, former Head of the London Ecology Unit, and author of the recently published ‘Nature in Towns and Cities’. Our London Churchyards Ecology Survey will also be featured in the programme. All are welcome, from all round London and beyond. Come for the afternoon or the evening or both, depending on your work and personal commitments. St John’s Wood is on the Jubilee Line, just one stop from Baker Street station in Central London. Prof Paul Rogers: " A centuray on the edge: from Cold War to hot war: 1945-2045"
and Fr Edu Gariguez "Peace and Justice Ministry vis-a-vis Resource Conflict: the Philippine Experience"
Rural Mission Sunday. Resources available from the Arthur Rank Centre, Stoneleigh. this year's theme: Bread: needing salt, yeast and water. There is a nice poem - but it gives no reference to soil - which is tragic, as we are losing top soil in this country and in the world far more quickly than it is being formed, and it would have been a good opportunity to have rasied this issue. So if you use their material try and fit in something about soil. 8-15 Aug Lee Abbey, Devon Andy Lester , David Nussbaum Jubilee for Creation - Why the whole of creation needs a Sabbath rest Through a series of morning sessions, we will explore the need for both us and the wider creation to stop, pause and take a break. This A Rocha wildlife family week will focus upon a gentle exploration of the biblical idea of jubilee in the context of the environment. David Nussbaum (Chief Executive of WWF-UK) and Andy Lester (Conservation Director for A Rocha UK) will lead us through this week, which will also include a dramatic performance of The Last Cuckoo by Andy Harrison (film and stage actor). 12 Sept Bradford Cathedral Creation Café Church Bradford Cathedral is hosting its first Café Church with an environmental theme. The Cathedral has 2 Ecocongregation awards and is always looking for new ways to encourage others to care for our environment. Join us at 2pm on Saturday 12th September for an all-age, informal, interactive service and cake! We will also be introducing our new Autumn project. For further information, please contact the Cathedral office on 01274 777720. 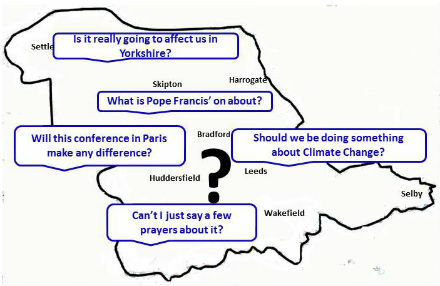 17 Sep-30 Nov Leeds and district and Harrogate 17 Sept-30 Nov: A huge series of events in the Leeds and Harrogate Area:Peoples Pilgrimage Leeds - Theology and Action around Climate Change: including: St Mark's - Harrogate; - Many different events Trinity-Ossett 17 Sept "Baked Alaska", Leeds Church Institute; 22 Sept: "Whats the Good News for Creation?" 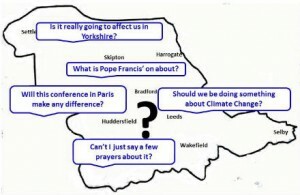 Leeds Church Institute; 25 Sept: John Battle on "Laudato Si" St George Centre: 25 Sept - Schumacher North: "Building local Economy" St Chad's, 17 Oct "Jesus and Wild Nature" Claire's Chapel-University, 1 Nov Pray and Fast for the Climate St Edmunds Roundhay 6 Nov "Baked Alaska" Meanwood Urban Farm, 7 Nov Wild City-Retreat. Sat 19 Sept Peterborough Cathedral at 7.30 pm in the Cathedral. Riding Lights Theatre Company present Baked Alaska (a play about the environment). 21 Sept Bexhill UN Peace Day, Peace Vigil on Bexhill beach, opposite the Clock Tower, West Parade. 12 noon – 1pm. A quiet time with interfaith prayers, songs and chants. Come and name the peoples and countries where peacemaking and peacekeeping is needed. For more details phone: 01424 214327. Light The Way, supported by OurVoices and Fast for the Climate, is a mobilisation of vigils happening around the world on 24 September 2015, the night before the Sustainable Development Goals are announced. The first test of the Goals is a strong climate treaty in Paris in December, so before then it’s vital to make world leaders aware of the support they have from all of us to act boldly. You can add your own vigil to the map on the Light The Way website. 24 Sept London Special gathering on London's Millennium Bridge. 26 Sept Bexhill Saturday 26 September, 11am—12 noon. Talk and Discussion: Dr Edward Echlin, ‘Soil as Community’.2015 is the United Nations International Year of Soils. Venue: Meeting Room, Parkhurst Hall. Access from Parkhurst Road. Organised by Bexhill & Hastings United Nations Association. Coffee served from 10.30am. For more details phone: 01424 733649. Attendance is free and a buffet lunch will be included. 3 Oct Bexhill Sharing Day: ‘Justice/Peace Matters! Give Peace a Chance’. 10.30am – 4pm, Morning: Short presentations by a variety of Justice/Peace organisations, and exhibition. Afternoon: World Peace Café – sharing with six speakers, your ideas for positive way forward. Venue: Bexhill Friends Meeting House, Albert Road. Free entry. Supported by Bexhill Quakers. For more details phone: 01424 214327. 4 Oct Newcastle ASWA: Anglican Society for the Welfare of Animals: The Annual Service for 2015 will be held at St Nicholas Cathedral Newcastle on Sunday 4th October (Animal Welfare Sunday). 10.00am Eucharist. Preacher - ASWA Patron - The Rt Revd James Jones. 10 Oct Hilfield Friary Dorset ‘A day on Renewable Energy and Energy Saving’ , sharing what the Friary has learnt from its recently installed biomass system. ‘Towards a Contemplative Ecology’ , how the contemplative tradition can provide wisdom for living in the world today, led by Br Sam SSF. The Justice, Peace & Integrity of Creation (JPIC) Southwark Autumn Assembly 2015 will take place on Saturday, 17 October at The Pavilion, CAFOD, Romero House, 55 Westminster Bridge Road, SE1 7JB. Theme for the Day: Can We Eradicate Poverty? (17 October is observed by UN as International Day for Eradication of Poverty). Canon Giles Fraser (“The Loose Canon”) Interviewed by Alison Gelder, Director of Housing Justice, Fr. Richard Finn (Dominican Priory of St. Michael the Archangel) on Catholic Social Teaching and the Eradication of Poverty from a theological perspective, Heidi Chow (Global Justice Now) on Food Sovereignty - How corporate dominated food systems affect communities and small scale farmers, & A CAFOD Speaker on Poverty caused by Climate Change. All Welcome. No charge to attend. Tea and Coffee provided. Please bring your own lunch. Winchester One World Week : ‘Laudato Si’ - A Gathering on Climate Justice’, at St Peter's Pastoral Centre, Jewry Street, Winchester. 11am – 3pm. Two talks - on Climate Change and the Pope’s Encyclical by Professor Bob Whitmarsh, National Oceanography Centre, Southampton University and Ellen Teague of Columban JPIC. The overall theme is Climate Justice, a chance for reflection and discussion prompted by Pope Francis' encyclical. It is during One World week, so reinforcing the message of our common global responsibility and the consequences of inaction if we do nothing. 18-24 Oct UK Good Money Week -Organise an event. Lots of Resouces available. 24 Oct Exeter ECCR's Good Money Week 2015 Conference Saturday 24 October, 10.30 am - 4.00 pm St Michael and All Angels Church, Mount Dinham, Exeter, EX4 4EB The conference will explore the role of money in our personal lives, our churches, our society and its impact on the world around us. We will hear from experts in their field, participants in ECCR’s Ethical Money Church project and have interactive dialogue between those who have a particular interest in faithful stewardship of money and opportunities to use it for the Common Good. Professor Timothy Gorringe will deliver the key note lecture. There will be opportunity in taking part in workshops on a variety of subjects, including the wider work of ECCR and the EMC Project. There’s still time to book a place, atThe cost is £5 (students: £3), or simply e-mail sabrina.groschel@eccr.org.uk and say you’re coming. 26 Oct London Conversations on "Laudato Si" 6.00pm. 27 Oct Hereford Hereford Christian Ecology Group, in conjunction with Churches Together in Hereford and the local Global Action Now group, present 'Where There’s a Will There’s a Way', a talk on combating climate change, by Richard Priestley, at St John’s Methodist Church, St Owen St, HR1 2PR, at 7.30 pm. Free admission, donations invited. ‘Caring for Our Common Home - A Study day on Laudato Si’ with Ellen Teague of Columban JPIC. St Patrick in the Meadows, Launder Street, Nottingham NG2 1JQ. 10am – 4pm. Mass will be celebrated by Bishop Patrick McKinney. Use these Pilgrimage Prayers to help you design your own local pilgrimagewhere you are. If you do this, please do add your pilgrimage to the events on thePilgrimage2Paris website and the People's Pilgrimage website, so that you in turn inspire others. to be held in PARIS, 30 November - 11 December. 3 Nov Lambeth Palace, London Lecture by Ecumenical Patriarch Bartholomew A lecture on environmental issues is to be given by His All Holiness Bartholomew, Archbishop of Constantinople – New Rome and Ecumenical Patriarch at Lambeth Palace on 3 November at 11 am. 7 Nov Cuddes-don Talks at Ripon College, Cuddesdon -The CRES (Christian Rural and Environmental Studies) programme is holding a day of talks open to all. Speakers are Chris Naylor, Executive Director of A Rocha International and Martin and Margot Hodson. Chris Naylor will speak on his new book "Postcards from the Middle East: How our family fell in love with the Arab world," and the Hodsons will look at an issue covered in their new book. Email cres@jri.org.uk for further information or to book. The conference will be chaired by John Battle and we hope that everyone can stay to share a simple lunch prepared by parishioners from St.Benedict’s. There is no charge for attending this event but a collection will be taken to help defray expenses. Andy Challinor’s work focusses principally on food security and health, especially amongst those societies that are vulnerable to climate variability and change. COST : £12 for the day. Limited places. and author from Edinburgh, -his first book was Listening for the Heartbeat of God : A Celtic Spirituality. The day will consist of presentations and silence, music and meditation, and a sharing with one another as we seek to renew our commitment to the holy work of transformation in our lives and in our world. 17 Nov London 'Threatened Forests' - from UK biomass energy policy: film screening and public meeting.London, UK premiere of 'Threatened Forests' film which uses Drax power station as a case study for how UK biomass energy policies threaten the native forests of the US and Canada. Also speakers from US conservation organisations campaigning against the destruction of highly biodiverse and carbon rich wetland forests in the USA for pellet production. A multifaith vigil to uphold those working for a low-carbon future at the Paris Climate Summit. 5 Dec Reading Reading Climate Day - at Reading Minster, St Mary's Butts, Reading, RG1 2LN. The day of events is intended as a Christian response to the Paris climate summit, with high profile speakers and activities to raise awareness about climate change. 10am - 2pm "Green Christmas" market. Browse our selection of environmentally friendly and fair-trade crafts and ethically-produced foods, and snap up a present that won't cost the earth. 4pm "Cafe Theologique"-style talk. A chance to enjoy a late afternoon drink while you listen to renowned climate scientist Professor John Mitchell, Principal Research Fellow at the Met Office, talking about his work. Followed by time for questions and discussion. 7pm Climate Mass (with reception from 5.30pm) A climate-themed service led by Bishop Andrew, with top environmental theologian Dr Ruth Valerio preaching.- + a wealth of information, exhibition of photos, activities and interactive prayer stations throughout the day and into the evening. - All are welcome! 26 Dec 2016 Ripon 9.30am-12pm Boxing Day 3 mile walk from Ripon Cathedral to Fountains Abbey - See pics and videos from 2011-part 1 (The walk) and part 2 (fungi, flowers and furry friends)Short St Stephen's Day Communion at 9.30am in the Cathedral. The service at Fountains may be scheduled to finish at 12pm but I think that is optimistic. ..Then walk 3 miles back to Ripon again.